Use hand held sprayers for application of this product. One Gallon of this chemical is needed per 800-1,000 sq.ft. to get good coverage, Some snow / ice will dissipate on its own, otherwise a shovel is all you need. No heavy equipment is needed for removal of snow or ice. Productivity and efficiency is the main benefit. As an example, if a driveway normally takes one hour to clear without the de-icer, then it would take 10 minutes if applied 48 hours before a storm hits. Use the Heat Wave liquid de-icers for applications in areas up to -25 °F for deicing or anti-icing needs. If pre-wetting at extremely low temperatures up to -45 °F, use the Road Guard as a great solution. It can be mixed with sodium chloride brine and is 85% less corrosive than rock salt or sodium chloride. It is used primarily for prevention of snow and ice in extreme cold weather. Consider using any of these deicer products as a way of helping prevent accidents and lawsuits. Inhibited Calcium Chloride Brine. This deicer product has been tested and proven to be effective to -25 °F. It is ready to use and requires no mixing or diluting. Heat Wave is unique to the market because it has a high percentage of calcium chloride and incorporates unique corrosion inhibitors with a natural fertilizer. 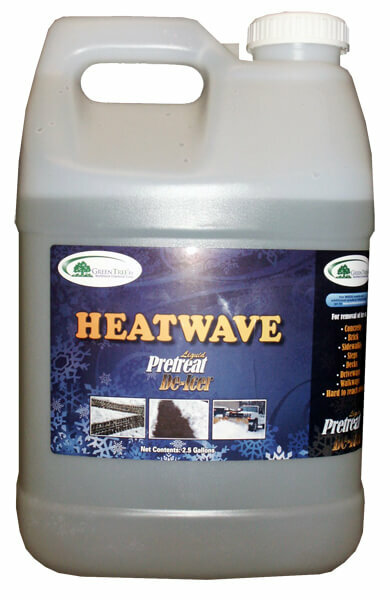 Apply Heat Wave before a storm hits and it will provide up to 48 hours of residual activity. It will not allow ice and snow to bond to concrete and asphalt. This makes cleanup and removal of tough ice and snow fast. * Refundable $145 deposit if returning the 275 gallon tote. It is necessary to have safety tools to keep you safe and maintain your snow equipment to keep your snow machines functioning. These tailgate salt spreaders can be easily mounted on utility vehicles, ATVs, tractors, and pick-up trucks by one person; A low maintenance tool with no pulleys, sprockets, chains or belts. These lines of gas snow throwers use Troy-Bilt or Briggs & Stratton engines and have electric start and mitten grip manual recoil starter. Clearing width from 21” to 45” with 2 year limited warranty..
Our infrared heaters are efficient and low fuel consumption compared to regular heaters. These are portable heaters that can be used for personal heating, drying surfaces, winter construction, asphalt and concrete preparation and more.